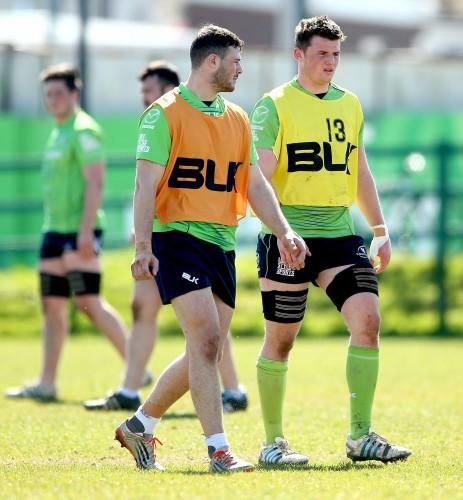 From a distance, Connacht back row Eoghan Masterson could easily be presented as a textbook example of how the IRFU’s development pathways are working smoothly. Pinch the screen and spread your fingers, however, and you’ll be zooming in on a map that was less than straightforward. Instead, Masterson is a prime example of how much attitude and, at times, the downright balls that are required to make the leap from promising youth to an elite academy. Connacht’s up and coming number eight hails not from any of the traditional rugby-producing corners of Ireland, but from Portlaoise. He was educated at the town’s CBS “where there’s no rugby whatsoever. It’s a football and hurling school,” Masterson told The42 this week. 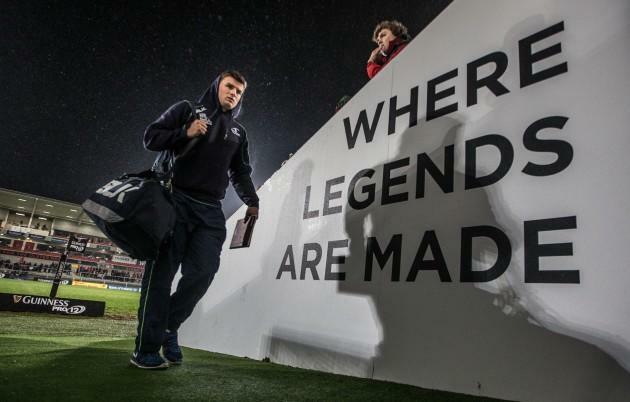 Even so, he kept his head down, treating his matches with Portlaoise RFC as the be all and end all. He was plucked out for representative midlands teams and represented Ireland under 18s a year early. He would captain that side 12 months later knowing the pathway was firmly beneath his feet. And then he slipped off it again. Injury ruined his hopes at stepping up an age grade and when it came time for 20s, the hangover still dogged him. He describes his eventual inclusion during the tournament as a two-minute cameo towards the end of a game and the experience still seems to sting a little. “Mike Ruddock was in charge at the time and it was quite a sickener. I took it pretty badly,” says the Laois man who turned to his father for advice. Masterson snr is from Scotland, and in that downbeat spring of 2013 he sat down with Eoghan to weigh up the options available to him. Recruiters from the SRU had already come to ask about the availability of the powerful number eight, and Masterson wasn’t ready to pass up a chance of tasting the Junior World Championship. Masterson earned his Scotland jersey that summer and scored for the land of his father during a group stage defeat to Wales. He played alongside current Glasgow stars Jonny Gray, Mark Bennett and Adam Ashe as well as another man who chose another nation after the tournament, Italy international Tommy Allan. “I enjoyed the experience, but it wasn’t what I initially planned. I’m very thankful for the experience, Dad was pretty happy to see me playing for Scotland, but the choice isn’t his, you know what I mean? Masterson has a bullishness about him that makes you think that a full cap may not be all that far away. The same summer that he crossed the sea for a chance to play at the JWC, he went chasing after Connacht academy director Nigel Carolan. 20 then and 22 now, Masterson is a man who refuses takes no for an answer without squeezing the issue. “He came knocking on the door of Nigel Carolan,” said Pat Lam after his big fresh-faced back row made his made his full senior bow against Scarlets in 2013. 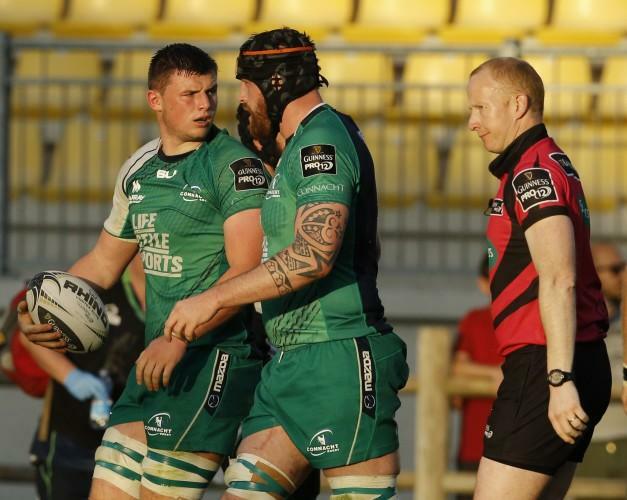 Armed with a new two-year development contract, Masterson has taken advantage of injuries to Willie Faloon and Jake Heenan to make himself a home – out of position – as Connacht’s openside flanker. Just as much as his innate confidence, Masterson exudes the down-to-earth politeness of a man who knows what it’s like to have slipped off the pathway and scrambled back on. He has a bottomless well of praise for Carolan for everything from opening the door to arranging his accommodation during the trial. He shrugs off the rare accolade of reprenting two countries at under 20 level. And he puts his bonus point-sealing against Zebre entirely down to forwards coach Dan McFarland. Much like Connacht themselves this week, Masterson is delighted to be competing at this level of the game, but that doesn’t mean he’ll be happy to settle for a consolation prize.